Did You Know A New Picnic-Themed Bar & Kitchen Has Opened At Phoenix? 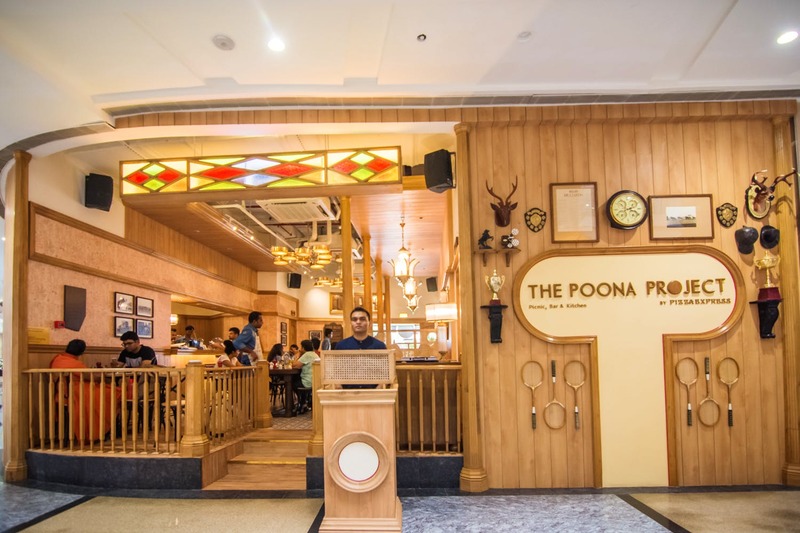 The Poona Project is a concept eatery by Pizza Express, located on the ground floor at Phoenix Market City in Viman Nagar. Touted as, ‘part bar, part kitchen, part picnicking spot’ – this intuitive and adaptive concept aspires to celebrate Poona’s heritage through food (with local-inspired dishes on the menu) and drinks. The Poona Project’s space is reminiscent (to us) of their Pizza Express restaurants – featuring simple, contemporary decor that makes it a good go-to destination for family meals, brunch with friends, or a romantic date night. Their indoor seating space is a mix of tables and booths – wooden, with plenty of warm lighting, and a bar counter running along the left side. Their outdoor space opens up into the courtyard and features a minimalist-monochrome colour scheme, tented cabana-style seating, and an entire wall covered in potted plants. ‘Picnic Feasts’ are served in actual picnic baskets – built for 2, 4, or 6 people – intended for the outdoor section only. Start your day with their all-day breakfast spread – which features items like a ‘breakfast pizza’, pumpkin pancakes, waffles, and more. Pizza fiends will be happy to know there’s an extensive selection of vegetarian and non-vegetarian pizzas available in ‘classic’, ‘Romana’ (extra thin), and ‘Calabrese’ (their iconic rectangular-shaped) crusts. The menu features Italian classics, as well as Indian-style dishes like ‘penne paneer makhani’ (also available with chicken), ‘murgh risotto’, and even Puneri favourite missal pav (served with house-made dough balls). Pasta, lasagne, risotto, burgers, sandwiches, sides, salads, small plates, and of course – an indulgent selection of desserts round up the food menu. For refreshments, choose from a fine selection of wine, champagne, sangria, bellinis, and beer. More PG-friendly options include juice, smoothies, milkshakes, mocktails, sodas, and tea/coffee. We visited The Poona Project and ordered their ‘hummus with rosemary bread’ to start our lunch with. For mains, we tried the ‘Pomodoro pesto’ pizza on a Romana crust – which was perfectly crisp, herbaceous, and delicious to eat. For dessert, we tried the slightly disappointing Banoffee Pie – which our server graciously replaced with a slice of chocolate cheesecake. Coupled with iced teas, our overall bill total came to just under INR 900 per head. It’s a bit steeper than your average cafe, but the quality of the food here is worth it. Their outdoor ‘picnic’ section opens on May 25, and we can’t wait to return and check it out!